We are about an hour north of the California border and our bed & breakfast is a contemporary 2 story home we have designed and built ourselves over a 20 year period. We have direct beach access and are located on a bit of a peninsula looking southeasterly over miles of unspoiled beach. 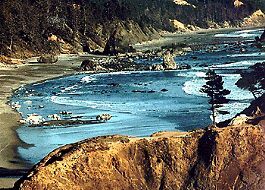 With reference to the above photo, there is a small cove below and Humbug Mountain is off to your right. We offer two guest rooms, each with a private bath and queen bed. One of our rooms is en suite with a rollaway bed available. It's a short walk to restaurants, public beaches, historic Battle Rock Park, and the town's harbor -- the home port of Oregon's only crane-launched commercial fishing fleet. Children possible. No smoking. Full breakfast. Laundry privileges. Off-street parking. Macintosh spoken. AOL available.